French money manager Thierry de la Villehuchet died of a likely suicide in his New York office early Tuesday morning. His death has been confirmed by the medical examiner. He had cuts on his arms, blood everywhere and sleeping pills nearby, detailed below. On Monday night, he told cleaning crews in his building that he wanted them out of his office by 7 p.m. because he was going to be working late. Workers returned Tuesday morning and found the door locked. He was later discovered dead at his desk, with a garbage can placed near his body to apparently catch the blood, Browne said. De la Villehuchet was a prominent investor who came from a long line of aristocratic Frenchmen, with the Magon part of his name referring to one of France's most powerful families. Villehuchet had plowed over a billion dollars he managed into Bernie Madoff's Ponzi scheme. Villehuchet, 65, was the co-founder of Access International, a company that raised funds on European markets to invest with Madoff, the former pillar of Wall Street accused of running a multi-billion-dollar Ponzi scheme. One of his close friends confirmed a newspaper report that Villehuchet committed suicide early on Tuesday, saying he had spoken to an employee at the company's New York office and that police were at the scene. Villehuchet "could not cope with the pressure following the outbreak of the scandal," the website of La Tribune daily quoted an associate as saying. Reportedly, 3/4 of the money Villehuchet managed was in Madoff's fund. Before founding Access in 1994 with Patrick Littaye, de La Villehuchet was chairman and CEO of Credit Lyonnais Securities USA, the U.S. investment banking arm of the French bank, according to Access marketing documents. De La Villehuchet was found "with his feet propped up on his desk, a trash pail nearby to collect blood," and no sign of a second person, Kelly said in the interview. The money manager had "multiple stab wounds" to his arms and wrists, and a box-cutter and pills were found nearby, Kelly said at a news conference. The NY Post confirmed of Villehuchet that there was no note. Thierry de la Villehuchet, 65, a co-founder of French fund Access International, slit both his wrists with a box cutter, cops said. He also took sleeping pills and never returned to his New Rochelle home Monday night. European fund managers who knew de La Villehuchet described him to ABCNews.com as a man who inspired "a lot of respect, honour, humanity, kindness and generosity." They said that despite misgivings on the part of his colleagues, Villehuchet had a strong belief in Madoff and had not only committed his own money to Madoff, but did so with 150 percent leverage - in effect his potential losses were greater than his actual wealth. Access International's LUXALPHA SICAV-American Selection fund invested solely with Madoff, and is one of several large funds that has been the subject of the ongoing federal investigation into what prompted them to place large amounts of client money with Madoff despite red flags that had been raised for well over a year inside the hedge fund community. The medical examiner has yet to confirm Villehuchet's cause of death. Judging by a Google search, Theirry de la Villehechet enjoyed sailing, with many regatta-themed results. 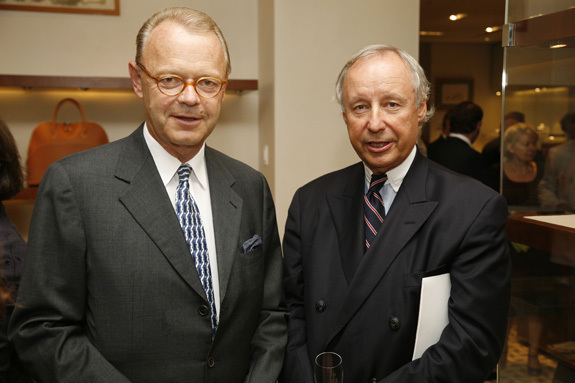 In the photo below from Patrick McMullan, a June 2007 Hermes store opening is attended by Villehuchet, right, with Hermes CEO Patrick Thomas. CORRECTION: The above photo originally purported to show Patrick Littaye, of Access. The other subject in the photo who appears beside Villehuchet is Patrick Thomas of Hermes. We regret the error.